We’re absolutely thrilled to announce that our Students’ Green Fund project Growhampton has won a prestigious Soil Association Organic Award in the Eating Out category. The Hive is Roehampton Students’ Union’s on-campus sustainability café. Made from upcycled shipping containers, it sells organic, ethical and local food and drink – with loads of it grown right on campus. Soups, sandwiches and sweat treats can be enjoyed with triple certified (organic, Fairtrade, Rainforest Alliance) artisan coffee and ethical teas. It’s also a social enterprise, meaning that all profits are reinvested in expanding the positive impact of the project. Thanks to its incredible success in just its first year, the project intends to expand into its own honey production, rearing chickens for free range eggs, as well as continuing supporting partnerships with local community charities. Whether it’s been through picking a sneaky strawberry outside the students’ union bar, or getting fresh vegetables, real bread and delicious vegan cakes from the weekly marketplace, students have seen sustainable food production embedded right across campus at the University of Roehampton. In a world where the distances between producer and consumer are ever widening, and inefficiencies in our food system are only worsening, projects like Growhampton are creating new solutions to today’s sustainability challenges. 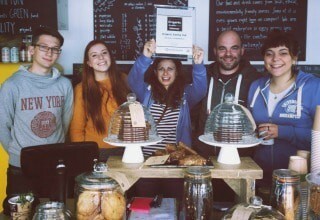 We can see why the judges and the public were so impressed with Growhampton and the Hive Café. It’s just one example of how Students’ Green Fund is embedding sustainability into the student experience across Higher Education. We’re so thrilled they’ve been decorated with an award from an organisaiton as prestigious as the Soil Association, and we can’t wait to see the project continue to thrive and expand.